Besides the cheap prices (I swear it's really cheap! This dress was sold only $29.99! ), the customer service was very good. They are really serious with me as their partners, even try to please me just like their customer. So, I really recommended DinoDirect to you. Don't worry, I carefully choose my own partners. This dress is so simple, but cute nonetheless. Besides, the fabric is so soft and comfortable. There's no detail on the front of the dress, so I had to add accessories, in order to make it look not so plain. And for me the dress was too short, so I wore a tutu skirt to add some length. What do you think of it? I love the outfit, its so cute! Thanks for the nice comments on my blog would you like to follow each other? im following you now ! beautiful, love the lace underneath! what a cute outfit. you look lovely! A wonderful blog! I really like it. "Do not give up on dreams, you never know when need be." Adorable! I love the aspect in the back. :) Cute look! You look stunning! I love the dress! what a cute dress :D love it! oh this dress suits you beautifully! i love your bag too. it's quite funny because i just posted my dress from DinoDirect. come check it out! FGC x PILE OF THREAD Giveaway for Indonesia-based Readers! absolutely love the dress it's amazing! can you follow me on both of them too?¿? stunning look! I just all black and red combos! Yay! little red riding hood! I love that character! love your bag and the dress is so cute!! we're new and would love you to visit our blog and if you like it please feel free to follow us! You are such a sweet lady, you look so cute. I love your outfit ,its very very pretty. Thank you for stopping by my blog and for leaving your sweet feedback. love the tutu skirt underneath! nice outfit. mind to follow each other? oh wow. this look is adorable <3 i love this dress and shoes! it's so classy <3 just love it. wanna follow on facebook and twitter aswell? I love the bows on the back of your dress! you look really pretty in red! What a cute dress! I love the details on the back and the ruffles are beautiful! awesome style, red and black, you look gorgeous! this dress is amazing, i really love it darlin! Thank you for visiting and comment in my blog! 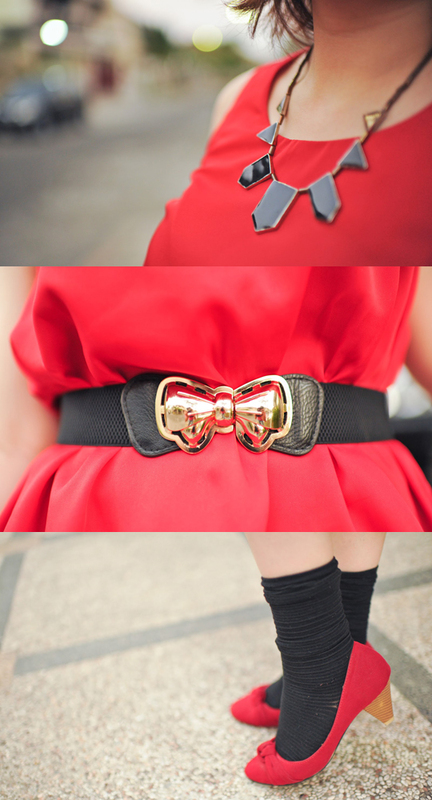 I really love you blog and your style, you look great in this red outfit.